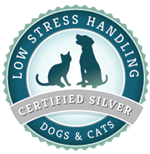 We are the first practice in New Mexico to be Low Stress Certified! Check out this link to learn more about Hill's Science Diet and Prescription Diet pet foods and find valuable coupons. Sierra Veterinary Services, LLC is a full service, modern veterinary facility. We are well equipped for both large and small animals and are here to serve the needs of Sierra County residents. Dr. Danielle Dawkins purchased Hot Springs Animal Clinic from Dr. Cardwell in May 2012. At that time Sierra Veterinary Services, LLC was up and running continuing to serve the residents of Sierra county. Our team is committed to providing our patients and clients with the most up to date and highest quality services. We strive to offer the best preventative, routine, and emergency care while being mindful of financial constraints. Our goal is to educate our clients in order to help our patients achieve the highest quality of life. We are dedicated to treating patients as if they were members of our own family while openly and honestly communicating with our clients.